Devore Heights, or Devore, is a rural and mountainous neighborhood in San Bernardino, California. It is located just north of the junction of Interstate 15 and Interstate 215, about 12 miles north-west of downtown San Bernardino. 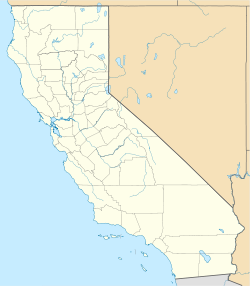 It is also the last town to pass through before taking the Cajon Pass to reach Hesperia, California. The area is just outside the boundaries of the San Bernardino National Forest; nearby cities/town centers include Verdemont, University Hills, Rancho Cucamonga, Fontana, and Rialto. Glen Helen Pavilion/Amphitheater, the largest amphitheater in North America, is located just south of Devore. Devore is completely within the city's 92407 ZIP Code and is within the 909 area code as well. Devore is served by the San Bernardino City Unified School District. Devore is home to Kimbark Elementary, a 2016 California Gold Ribbon School. While no middle or high schools are located within the neighborhood, the nearby neighborhoods of Verdemont and University Hills hold a middle school and high school, respectively. Glen Helen Amphitheater also known as Glen Helen Pavilion, is a local open-air concert hall that hosts to many music festivals. Mountain High is a local resort that is open in the Winter for snow sports (skiing and snowboarding). Devore suffered from a fire on October 25, 2003. The fire began at Waterman Canyon around 9:00 A.M and by 6:30 P.M the fire had grown up to 10,000 acres. The fire burned 91,281 acres, destroyed 940 residences, 30 commercial buildings and 300 outbuildings. More than 4,000 firefighters were called in effort to put this fire out. The Old Fire grew and spread towards the San Bernardino Mountains. The Old Fire grew so big that it merged with another existing fire, the Grand Prix Fire, across the Interstate 15 Freeway. Combined, these fires caused damage that spanned more than 30 miles wide. When this fire hit Devore, the city was still recovering from the Panorama Fire from November 1980 which had damaged 23,800 acres. The destruction caused by The Old Fire further damaged the land from a previous fire, The 1980 Panorama Fire that burned 23,800 acres. The Old Fire resulted in 6 deaths and evacuation of over 70,000 citizens. ^ "'California Fire Siege of 2003' made history". Sbsun.com. 28 October 2013. Retrieved 6 February 2019.